Experimental Theology: Meditations on the Little Way: Part 3, "My Vocation is Love"
Meditations on the Little Way: Part 3, "My Vocation is Love"
As mentioned in my last post, Manuscript B of Story of a Soul is considered to be the mystical heart of Thérèse's Little Way. It was written to her sister who asked her to describe her "little doctrine." The first part of the manuscript is addressed to Marie; the second, longer half is addressed directly to Jesus. After the introductory remarks to her sister Thérèse turns to address Jesus for the rest of the manuscript. She begins by recounting a vision of Anne, the deceased Founder of the Carmelites in France. In the vision Thérèse asks Anne if God is pleased with her. Does God approve of her Little Way? She said to me: "God asks no other thing from you. He is content, very content!" I feel within me other vocations. I feel the vocation of the WARRIOR, THE PRIEST, THE APOSTLE, THE DOCTOR, THE MARTYR. Finally, I feel the need and the desire of carrying out the most heroic deeds for You. She wants, "in spite of my littleness," to "enlighten souls as did the Prophets and the Doctors." To, like the apostles, "travel the whole earth to preach Your name," to "preach the Gospel on all the five continents simultaneously and even to the remote isles." She says, "I will be a missionary, not for a few years only, but from the beginning of creation until the consummation of the ages." She wants to be a martyr, to give everything to Jesus: "I would shed my blood for You even to the very last drop." She dreams of being like her fellow countrywoman Joan of Arc. And yet, there she was, a twenty-three year-old cloistered nun, and by her own account someone of limited talents and abilities. And though that might have been and likely was excessive humility, I think many of us can resonate with Thérèse's struggle. How many of us have wanted to head off to the dangerous mission field? To sell it all and walk off like St. Francis of Assisi? To speak to huge crowds like Billy Graham? To do something radical? We have heroic dreams for our spiritual lives. And yet, most of us live quiet lives among friends, family and co-workers. And the smallness of our spiritual lives can make us wonder, like Thérèse wondered, is "God not asking something more of me than my poor little action and desires. Is He content with me?" Here we find the great appeal of Thérèse's Little Way. It is a heroic path toward sainthood--the "democratization of holiness" as Thomas Merton called it--that everyone can travel. No matter how humble your talents or situation. There is a radicalness that can infuse the workaday. O my Jesus! what is your answer to all my follies? Is there a soul more little, more powerless than mine? I read there, in the first of these chapters, that all cannot be apostles, prophets, doctors, etc., that the Church is composed of different members, and that the eye cannot be the hand at one and the same time. The answer was clear, but it did not fulfill my desires and gave me no peace. Why? Because she still didn't know what her vocation was. Was she an eye, a hand, an ear, a foot? What part of the body was she? Without becoming discouraged, I continued my reading, and this sentence consoled me: "Yet strive after THE BETTER GIFTS, and I point out to you a yet more excellent way." And the Apostle explains how all the most PERFECT gifts are nothing without LOVE. That Charity is the EXCELLENT WAY that leads most surely to God. At last, she had found her vocation. The key to the Little Way. What part of the body would she be? She would be the heart. I finally had rest...Charity gave me the key to my vocation. I understood that if the Church had a body composed of different members, the most necessary and most noble of all could not be lacking to it, and so I understood that the Church had a Heart and that this Heart is BURNING WITH LOVE. I understood that it was Love alone that made the Church's members act, that if Love ever became extinct, apostles would not preach the gospel and martyrs would not shed their blood. I understood that LOVE COMPRISED ALL VOCATIONS, THAT LOVE WAS EVERYTHING, THAT IT EMBRACED ALL TIMES AND PLACES....IN A WORD, THAT IT WAS ETERNAL! Then, in the excess of my delirious joy, I cried out: O Jesus, my Love...my vocation, at last I have found it....MY VOCATION IS LOVE! This is the mystical core of the Little Way. To follow the Little Way is to commit to being the heart of the church. The Little Way is to become love incarnate in your day to day existence with others. No grand overseas adventures. No speaking to massive crowds. No riding off like Joan of Arc. Simply becoming love. Right here. Right now. Thérèse is called "The Little Flower." One reason for this is a metaphor she goes on to use to describe what being love--the heart of the church--is like. She compares the Little Way to strewing flowers around the throne of God. Each small act of love we do is a flower strew in the Courts of Heaven. I have no other means of proving my love for you other than that of strewing flowers, that is, not allowing one little sacrifice to escape, not one look, one word, profiting by all the smallest things and doing them through love..
Strewing flowers might seem a bit girlish and feminine. I doubt someone, say, like Mark Driscoll sees himself strewing flowers around the throne of God (though I've spent a good minute here smiling as I imagined that). But sentimentality aside, there is steel here. Requiring a hard, Navy SEAL-like discipline. The discipline of the Little Way is to make every act of sacrifice during the day, every look, and every word flow from love. Yes, these are little things, each act a small "flower," but I bet you are beginning to appreciate the heroic audacity of the spirituality of the Little Way. The Little Way isn't, when put into practice, very little at all. It's pretty damn hard to do and you'd be heroic for even trying it. That's why Thérèse is a saint without the riding off to grand adventures like Joan of Arc. Some adventures are standing right in front of you. Yes, each little flower--each loving word, act, or look you give today--is a little thing. But cumulatively? It's the love of God incarnate. In you. For the world. Thérèse reminds me of MacDonald's ever-present overlooked characters. At the moment, I'm reading 'Alec Forbes of Howglen'. I think Annie Anderson and Thérèse would have got on well. My new year's resolution is to better live out the theology (not sure of a better word) I've come to understand over the last few years - to live out what I feel quite able to preach to others about. I really appreciated your recent thoughts on mindfulness. Thérèse feels like a great - and a reassuringly possible - place to start - thank-you. In our time, love is often measured in dollars. Therese's story gives me hope that God can be pleased with those of us whose abilities are limited. In his time, George MacDonald was a man who lived in poverty, with poor health, and many mouths to feed. Yet the difference he's made through his life and writings ... immeasurable. ... and love fulfills the law. 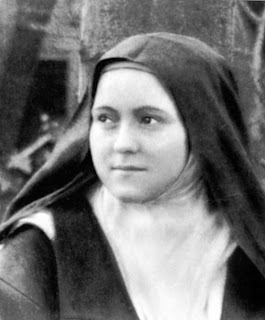 Thérèse reminds me of Brother Lawrence and "The Practice of the Presence of God the Best Rule of a Holy Life" (available from project gutenberg). I'll need to read it again and in parallel with thinking about practicing the discipline of the Little Way. I haven't read Brother Lawrence but I'm reading the diaries of Dorothy Day right now and she talks a lot about the Little Way and practicing the presence of God. This makes me think the ideas of Thérèse and Bro. L are complementary. This reminds me of something I red Tony Campolo say once (and I paraphrase from memory). He told of having students come to him and ask him what God had in plan for their lives. His response was to say that he did not know that answer, but he knew what God planned for them right now; to love. I am struck by the radical and costly way of Therese, and as you say, the way of humility, the way of love, is no small feat at all, but perhaps the hardest thing of all. P.S. I have been inspired to read 'Story of a Soul' by your posting, and so far (five chapters in) I am very grateful. Powerful words of truth. Sounds so simple; but the hardest of all. "as long as I'm not the appendix...". Was it Larry Norman who said he thought he was the ingrown toenail? Thank you for sharing this! By the way, I'm 86 percent done with your book on my Kindle, and found her story to mesh with what I'm reading. Exactly! To be completely selfless. Love in full. It is all gift...what God is.